Showing results for tags 'LEGO Digital Designer'. This is Samus Aran, a famous bounty hunter and the main protagonist of the Metroid game series. Made as a very belated b-day gift for a good friend. Made in LEGO Digital Designer, rendered with POV-Ray, postprocessed in Adobe Photoshop. Total time: 9 hours. While learning LDD, I am facing a problem. I used Hinge Align Tool to fit a Bean with my model which I added successfully. But it resulted a slight tilt to my whole model with ground, which I do not want. So now one end of model is on ground where other is a bitrHow can I rotate the whole model to rest it completely on ground? For the past two days I've been experiencing a never-before-seen issue with Lego Digital Designer, and while I previously mentioned it in the bugs and brick errors topic, that got no response and I think the issue is significant enough to merit its own topic. Basically, whenever I try to save a new file on LDD, the program crashes. Generally this happens partway through saving, resulting in a tiny, unreadable LXF file with the name I had chosen for the new file. I can load, edit, and save previously-made LXF files just fine, but if I try to "Save As" under a new name, or save a new model for the first time, the program crashes. For reference, I'm using LDD 4.3.8, the current version (which I did try uninstalling and reinstalling to see if it fixed the issue—it did not). My computer is a mid-2012 15-inch MacBook Pro, running OSX Yosemite version 10.10.2. My computer was recently serviced at an Apple Store, where the AirPort wireless receiver was replaced, but I don't know how that could be to blame—particularly considering that saving new files with other programs works normally, and LDD itself functions properly apart from the inexplicable and crippling inability to save new files. Google has been no help at all in terms of finding a solution (or even anyone who can corroborate the issue), and while I have contacted Lego customer service to see if they could report the issue to the LDD team, I'm unsure whether they'll be able to figure out the cause of my problem. As such, any assistance from the Eurobricks community would be greatly appreciated! 3DVIA Printscreen can capture LEGO Digital Designer models and save them as 3DXML files. It was discontinued years ago, but can still be downloaded from the web archives (direct installer link). Not many programs can load 3DXML files, so I made a program to convert them to OBJ. It does some other helpful things too. Download The resulting models are far more optimized for realtime rendering (games, AR, etc) than exports from other LEGO building software, thanks to LDD's hidden stud/tube removal. For example, a small house model that's 50350 tris exported from LeoCAD is only 13548 tris with this method - and with some additional tricks, only 2586 tris. More info here. I've only made this to work with LDD captures, compatibility with captures from other programs is not guaranteed. It will automatically name materials and textures with their official LEGO names/IDs. Setup: 3DVIA Printscreen should be configured so "Capture of textures" is on, and "Group by textures" is off. LDD should have high-quality rendering options disabled. 3DVIA Printscreen must be launched BEFORE LDD. Usage: Save your LDD model in 3DXML to OBJ's "Models" folder. Launch 3DXML to OBJ and enter your LDD model name in the first text box, then click "Move camera". This saves a new LDD model with the camera set in the proper position for 3DXML capturing. Open the new LDD model (it will have CAM_SET in the name) and capture it to a 3DXML file with 3DVIA Printscreen. Make sure it's saved in 3DXML to OBJ's "Models" folder, like the LDD models. Enter the name of your 3DXML file into the second text box in 3DXML to OBJ. I recommend leaving "Weld duplicate vertices" enabled. Choose a new color palette if you'd like, and click "Convert". It sounds more complicated than it is. Here's a model being converted and imported into Unity: Clicking the "Advanced" button will give you a bunch of options related to LEGO Universe-style color variation. However, making use of these features requires modding LDD, which I don't think is allowed to be discussed on Eurobricks, so I won't talk about it here. It's mostly only useful to people who are modding LEGO Universe and need to match its art style, anyway. LDD's hidden geometry removal gives pretty good results on its own, but with some trickery you can get even more mileage out of it: You can tell 3DXML to OBJ to not export bricks in certain colors, which is useful for "dummy bricks" only placed in the model to trip LDD's hidden geometry removal. In 3DXML to OBJ v1.8.0_Data\StreamingAssets, you will find "Color Export Exclusion.txt". Add the desired color IDs here, one per line. Covering studs is obvious enough, but tubes are a bit more finicky. Original LDD model, vs export with the dummy bricks excluded: A simple brick has the entire underside present. These quickly add up to loads of polygons. Placing 1x1 round plates across the surface causes LDD to replace the underside with two triangles. Nice! There's a small handful of other parts with this effect, but 1x1 round plates are the best. In fact, even just one 1x1 round plate can trigger this so long as the rest is still covered. Covering the bottom entirely will cause LDD remove it 100%. Beware: Some bricks, like those rounded 2x2 pieces, will look like they have the same effect as 1x1 round plates, but actually don't... They still leave much of the tubes intact. This trick is how I got that house with 13548 tris down to only 2586 tris - simply by capping off the bottoms of the roof and walls. More tips and tricks! If 3DVIA Printscreen is causing LDD to freeze and/or not launch, see this post. If you have developer mode enabled in LDD, you can press Shift W to toggle wireframe mode. You can also turn rendering of different parts of bricks on and off. LDD's bricks come in four sections, and can be toggled as such: K: Toggles studs Shift K: Toggles bottom and inside of tubes Q: Toggles outside of brick Shift Q: Toggles bottom and inside of brick You can use this to, for example, capture a model without studs, and use that as a lower LOD. Don't have developer mode enabled? Go to the same AppData folder as db.lif and developermode=1 to preferences.ini. You can add your own custom color palettes, just go to 3DXML to OBJ v1.8.0_Data\StreamingAssets\Custom Palettes and use the existing files as examples of how they work. If for some reason you need to, Shift R resets 3DXML to OBJ's saved preferences (resolution, most recent conversion options, etc). 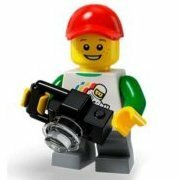 Hi everyone I'm a regular on Eurobricks but this is the first time I've posted anything in the digital building forums. I've recently started to design MOC's using Lego Digital Designer and this is my first creation... All the images were rendered using Blue render which I like because it's fairly fast and incredibly easy to use. I was quite happy with these images but then I saw a few other renders that people have created online and am blown away by the quality of them. Some of them are so good that it's hard to tell they aren't built from real bricks. Can anyone suggest to me, the best software or method of rendering images from models created in LDD. I've tried POV Ray but am not that impressed with the results. Even in top quality the renders seem to have a fake looking sheen that makes them look artificial and almost as if they've been shrink wrapped in plastic. It also takes hours to render the images on my PC using POV Ray. I've been pouring over other threads in the forum and have read a lot about people using Blender. As far as I can tell though the only way of getting LDD models to open in Blender is by converting them to LDraw files first. When I tried this though it messes up a lot of the bricks in my model. Similarly I tried importing them in to Mecabricks but this messes up any bricks that have printed elements on them. Does anyone know of another way of getting LDD files in to Blender directly without it messing up the models? From what I've seen, Bluerender seems to be the most user friendly option for creating renders. I read somewhere on here that a "Sunflow" patch had been created for Bluerender which gave a more realistic result with better detail and the Lego logo on each stud. When I followed the link to download this though it redirected me to a different site, so I assume this patch has since been removed. So I'd be very grateful if anyone could suggest anything I can do to make my renders look more realistic or suggest any other software or methods that might give a better result. Thanks! A few days ago, I decided to make something in LDD based off of a book I'm writing. I think it turned out pretty good, so I decided to share it. Here's a view of the top: From the side: Minifigs I decided to add: A door/hatch I put in the back: The interior, with controls: I also put a cannon on top: Finally, here's the LXF File Feel free to leave suggestions and feedback, I appreciate it! Hi Guys. After looking at pictures of the NEW 2018 LEGO 60198 Cargo Train, I was able to try to replicate it in LDD. Obviously, it isn't 100% correct, and I couldn't build the forklift, BUT, I think I did pretty well! I am thinking of tackling the new hospital that is coming out soon too! Hello, I'm new to this community, but have been building Lego my whole life. My favorite themes when I was growing up in the late 80's and early 90's were Castle and Pirates. In recent years, my favorites are the Star Wars UCS sets, though I'm especially impressed with some of the MOC's both of Star Wars and in general. I first found this forum when I was wondering why Lego hasn't done a set for the Star Wars Nebulon-B Medical Frigate from the Rebel flleet. A google search turned up the absolutely AMAZING MOC of the Nebulon-B by Mortesv, and as I read more about that I of course found a thread or two talking about it in this forum. Over the last few years I've become very impressed with the online tools we have thanks mostly to the ingenuity of the Lego community. 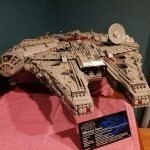 Most people, even probably a lot of people that have Lego or buy sets for their kids, have no idea that sites like Bricklink, Brickset, and Rebrickable, exist. The sheer number of online store fronts on Bricklink, and the enormity of how many individual parts there are just boggles my mind. The amount of data that Brickset can tell me about my collection is fascinating. I am now trying to learn about the Lego design software that until a week ago I wasn't aware existed. It seems like Lego Digital Designer is kind of broken and not supported by Lego, yet it seems like folks are still using it? What about Stud.io? Is that more or as popular? Or is there other software besides those? I feel like I am just scratching the surface of the new things I want to learn about - and this forum seems like a great place to figure it all out! Looking forward to participating in this community, almost as much as I am for my two year old getting old enough to graduate from Duplos into Lego! Hi I'm using lego digital designer and I hope I'm not the only one who does this, but I love making my own brick decals or "stickers" by using this method:http://www.rockraidersunited.com/topic/5399-tutorial-adding-custom-decals-into-ldd/ or some other website I forget. But I cant add a decal to this door piece, (58381) I do what the instructions from the link above told me, It works for most pieces but not this one please help. Lockon Commander (Mobile Frame Zero) by Artemiy Karpinskiy, on Flickr This is an upscaled Lockon-type Frame from popular fan-created LEGO wargame “Mobile Frame Zero”. The Lockon Frame is created by Vitor Faria. Trace (Axiom Verge) by Artemiy Karpinskiy, on Flickr Trace is the main protagonist of the videogame Axiom Verge, a pixel-styled metroidvania that was created by a single person as a "love letter" to Super Metroid. Trace was a scientist in a laser lab stationed in New Mexico. One day some sort of malfunction occurred, bringing down the lab along with science team, including Trace. Next thing he knew, he awakened in a strange, alien place, to the voice of a stranger who introduced herself as Elsenova. Armed with nothing but a biomechanical Axiom Disruptor gun and Elsenova's voice, Trace must find his way back home... Shoutout to Demitsorou for post-processing the original render. They've knocked it out of the park lol. Hi everyone! I found an old post here on the forums regarding the UnplaceableBricksDump.lxfml file. This file could be opened in a text-editor to figure out what parts had been removed because they were placed incorrectly. It said something that all pieced in this file got yellow and the once that had been removed in the lxf-file would be red here so it would be easy to search for them and find out what piece it was. However, the answers in that post only covered this file in a windows-environment and I have tried to find this file on Mac for quite some time now. Does anyone know where this file might be placed on OSX? Does it go by the same name and the same file-extension or is it something different? Hope someone can help me? Many artists during October take on the Inktober challenge, drawing in ink every day of October. This year I decided to do something similar, but with MOCs. I've already done a few mechas based off Ksenolog's sketches, but this time around I decided to dedicate a whole month to translating his amazing works into digital 3D lego. 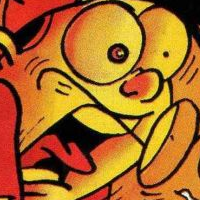 This thread is a full collection of my MOCtober entries. #01 Dailybot #699 Original Picture: #02 Dailybot #684 Original Picture: #03 Dailybot #672 Original Picture: #04 Dailybot #692 Original Picture: #05 Dailybot #654 Original Picture: #06 Dailybot #703 Original Picture: #07 Dailybot #601 Original Picture: #08 Dailybot #572 Original Picture: #09 Dailybot #557 Original Picture: #10 Dailybot #522 Original Picture: #11 Dailybot #544 Credit to my spouse for helping with the bg. Original Picture: #12 Dailybot #490 Original Picture: #13 Dailybot #710 Original Picture: #14 Dailybot #700 Original Picture: #15 Dailybot #702 Original Picture: #16 Dailybot #675 Original Picture: #17 Dailybot #594 Original Picture: #18 Dailybot #714 Original Picture: #19 Dailybot #619 Original Picture: #20 Dailybot #633 Original Picture: #21 Dailybot #617 Original Picture: #22 Dailybot #636 Original Picture: #23 Dailybot #583 Original Picture: #24 Dailybot #634 Original Picture: #25&#26 Dailybot #634 Original Picture: #27 Dailybot #724 Original Picture: #28 Dailybot #461 Original Picture: #29 Dailybot #439 Original Picture: #30 Dailybot #726 Original Picture: #31 Dailybot #575 Original Picture: There you go! Hope you liked what I’ve done! I certainly do like the result of MOCtober and I am very much proud of myself! <3 Please don't forget to go and check out Ksenolog's works! [Digital Render] Toa Komas (Friends OC) by Artemiy Karpinskiy, on Flickr This is Komas, an OC of my friend Sue, who have recently pledged to my Patreon. Here's a rotational GIF as a bonus: * * * If you like what I do and you want to see me create your OC, a favorite Bionicle Character, or something else, feel free to look up my Commission Info! I also run a Patreon page, so please consider supporting! Minecraft minifigure heads in LDD! I'm not sure if anyone is aware of this, but there's Minecraft minifigure head decals in LEGO Digital Designer! Here are examples. I discovered this when I uninstalled LDD and reinstalled it earlier today. How do you design for buildability? I spend long periods away from home and my Lego bricks due to my work, so I end up doing a lot of design in computer with the likes of LDD, LDraw/bricksmith, and mecabricks. The problem is that none of these have any "physics" in them, I can't ever see how strong or stable the model is. So I end up spending hours agonising over the way the bricks are stacked, worrying over whether or not they will lock together solidly enough in real life. I also spend ages checking brick link and Lego bricks and pieces to make sure the pieces I use are available in the colours I choose, but that's another story. When I finally do treat myself and buy the bricks for one of my creations, they invariably fall apart. A couple of years back it was a 50 piece micro-scale particle detector that took 2 hours to get together and exploded at the slightest touch (and I do mean that literally, bits went flying all over the room!). My latest fiasco is a model of the Mercury-Redstone rocket, which I designed to go with the Lego Ideas Saturn V. It's just a stack of 2x2 round bricks with three axles inside due to it's height, yet despite my best efforts to put the axle transitions well inside bricks, the rocket easily falls apart into three neat chunks (one for each axle). So, what's the secret? When you design in computer do you care at all about how the model would behave in real life? And if you do care, do you have any tips on making sure that the model holds up well when physically built? On May 7, 1961, astronaut Alan Shepard became then first American in space. Flying the Mercury capsule "Freedom 7", he reached an altitude of 187.5km on his 15 minute sub-orbital flight. This particular model is in scale with the recent Lego Ideas 21309 Saturn V/Apollo rocket. I’ve taken the scale from the Apollo command module, assuming 1 stud = 1m. Sadly, at this small size (just 2 studs across), it isn't possible to recreate the United States logo down the side of the rocket, or the distinctive black-and-white stripes in the aft section. If anyone has advice on getting custom prints done, I'd certainly be interested. I was nearly going to use the traditional Lego rocket fin for the tail of the ship, but I decided to try and recreate the black and white patterning on the engine block using some robot arms: I'm a little concerned about my use of a 3.18mm bar in the technic axle holes to hold the base of the rocket together, as it's an unusual technique that (I think) may be damaging to the 2x2 round bricks and plates. That said, it has been used in a few Lego sets so I'm confident it is at least "legal". The model features a display stand, based on the actual launchpad of the Mercury-Redstone: The Mercury-Redstone comes with a separate Mercury capsule on its own display stand - this version includes a 1x1 round plate on the base to represent the retro-rocket pack. This was a small engine that fired to bring Freedom 7 down to Earth on a good trajectory, but unfortunately there isn't the space to include it on the rocket stack. The Mercury capsule was topped by a 4.8m red escape tower, which would propel the capsule up and away from an exploding booster. While never used on manned flights (fortunately), it saw incredibly frequent use during the early testing of rockets! A nanofigure astronaut is included for scale… and yes, Mercury really was that tiny!! This is a digital MOC and hasn't been tested in real life. An older version has appeared on mecabricks, but this one has been updated to use parts that actually exist. Comments and criticism are always appreciated! On February 20th 1960, U.S astronaut John Glenn became the first American to orbit the Earth. Piloiting the Mercury capsule “Friendship 7”, launched atop a newly up-rated Atlas rocket, he successfully made three orbits of the Earth. The mission suffered various glitches, including thruster issues and a possible loose heat shield (which could have been fatal), but was essentially a complete success and paved the way for future American space exploration. (Base image from Wikipedia) This particular model is in scale with the recent Lego Ideas 21309 Saturn V/Apollo rocket. I’ve taken the scale from the Apollo command module, assuming 1 stud = 1m. The Atlas rocket was a 1.5 stage rocket. Unlike the Saturn V, which dropped complete assemblies of fuel-tanks and engines, the Atlas rocket jettisoned it’s two outer engines on the way to orbit. This is possible on the model: The Mercury-Atlas comes with a separate Mercury capsule on its own display stand - this version includes a 1x1 round plate on the base to represent the retro-rocket pack. This was used to de-orbit and return Friendship 7 to Earth, but unfortunately there isn't the space to include it on the rocket stack. The Mercury capsule is topped by a 4.8m red escape tower, which would propel the capsule up and away from an exploding booster. While never used on manned flights (fortunately), it saw incredibly frequent use during the Atlas rocket's early testing! A nanofigure astronaut is included for scale… and yes, Mercury really was that tiny!! This is a digital MOC and hasn't been tested in real life. Comments and criticism is always appreciated - I would also welcome advice on how to build a suitable display stand. There’s no way the rocket can stand on its engines, and not many connection points left near the base! [Render] Stryder-inspired Mech (Titanfall) by Artemiy Karpinskiy, on Flickr Here's a rotate GIF made in Bluerender: Here are bonus images: Click | Click * * *If you like what I do and you want to see me create your OC, a favorite Bionicle Character, or something else, feel free to look up my Commission Info! I also now have a Patreon page, so please consider supporting!